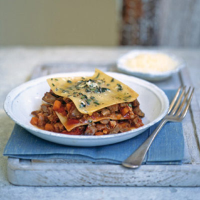 This recipe was inspired by one of Giorgio Locatelli's amazing pasta recipes – it's a cheat's version of ravioli, using lasagne sheets. Make double the quantity of the ragu if you like more meat than pasta in your meal. Heat 1 tbsp oil in a heavy-bottomed casserole pan until sizzling hot and brown the pheasant fillets all over. Set aside and heat another tbsp oil. Add the shallots, bacon, celery and carrot and sweat on a medium heat for 5 minutes. Add the garlic, pheasant and bay leaves and cook for another 5 minutes. Add the tomatoes, wine and sugar, and season. Simmer on a low heat for 20 minutes until the sauce has reduced and the pheasant is tender. Take out the fillets, slice up into small chunks and return to the pot. Simmer the 6 lasagne pasta sheets in a large pan of salted water for 10 minutes until al dente. Cut the sheets in half to make 12 small squares of pasta and drizzle in the remaining olive oil to prevent sticking. Chop the rosemary leaves and put in a frying pan with the butter. Heat until the butter is sizzling. Starting with pasta, alternate lasagne squares with sauce on 4 plates. Drizzle with the rosemary butter and serve with Parmesan. This calls for a fragrant wine with a light touch.